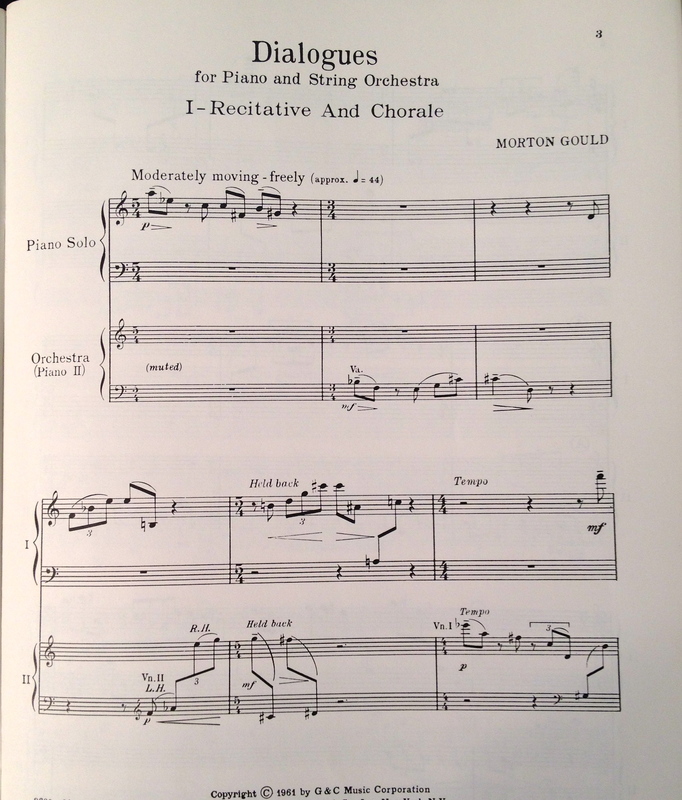 The classical music world tends to celebrate anniversaries, so the near-complete absence of attention to Morton Gould’s centennial probably indicates that his reputation is in decline. Gould cut a wide swath, writing and arranging prolifically from the cornball to the sublime. Albums of Kern and Porter pop songs outfitted for bachelor pad sit next to soundtracks for television, radio, and film; probably more important are concertos for piano, viola, clarinet, and even tap dancer. Regardless of genre, all of Gould’s music is unquestionably American in idiom, sometimes saddled with overt references to jazz, history, or folksy stuff. Symphony No. 4 “West Point” is essential for all bands, especially “The President’s Own” United States Marine Band. 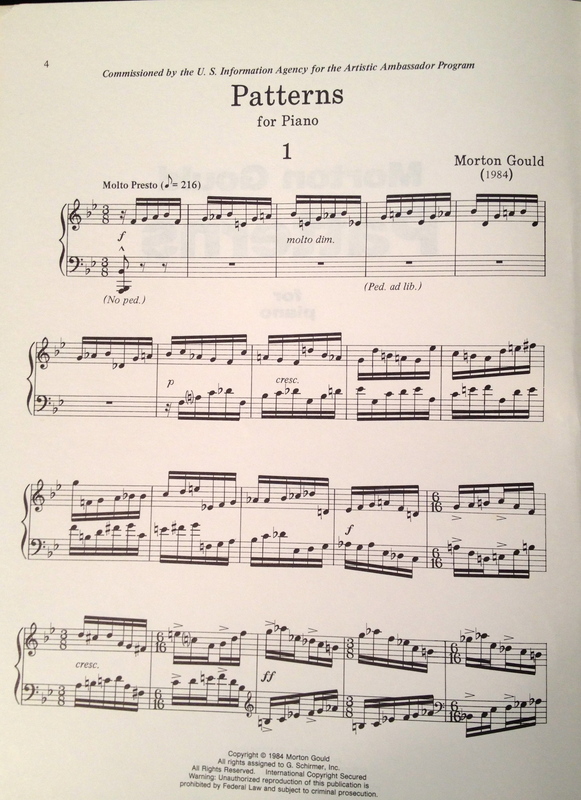 Gould churned out many marches and patriotic drills of dubious value. “West Point” is OK; Ballad for Band is better. “Boogie Woogie Etude” from 1943 is somehow still a bit in vogue as a raucous encore piece for concert pianists. It’s terrible. He wrote for anything and everything, but there’s no doubt that Gould was a born orchestral composer. While much of Gould’s earlier work is a dated mix of Stravinsky, Copland and Gershwin, it nonetheless always uses symphonic forces in ways both professional and creative. Perhaps since Gould was always busy yet never a star, he managed to keep challenging himself, searching for the music he really wanted to write. Starting in the 1950s, certain of his concert compositions began taking on a more lucid and serious tone. For my own private birthday celebration I’ve been repeatedly listening to three of his best. If any American orchestras do encores, they should really consider the 6-minute “Paeans.” It’s brilliant, modern, and accessible. The idea of a large scale symphonic work, rooted in and derived from the spiritual idiom, both black and white, was with me for some time… I thought it appropriate that a work commissioned for the American Bicentennial should reflect in some measure the sounds of America’s musical heritage. … No listener would guess that the highly charged, melodic music of black church-goers had anything to do with this score… He might have been better off giving the music and abstract title. Without an identifying blaze, the listener would have a better chance to hear it plain. Ah, but this is wrong, Gould knew exactly what he was doing. He’d already tried to do literal versions of black music for the concert stage and failed. Now, in his sixties, he’d finally realized that the source material needed to be radically transformed for it to have sufficient weight. The titles of the movements relate to the black sources only distantly, and the music only that much stronger with a commitment to abstraction. The final two movements, “Rag” and “Stomp” are a little less charismatic, but still enjoyable, especially in their more chaotic moments. The recording is OK, but we need one with more rhythmic authority, especially from the percussion section. StringMusic (1994) won the Pulitzer Prize for music in 1995. Despite that seal of approval, StringMusic hasn’t really entered the repertory. I’m rather surprised that there seem to be no performances scheduled this season for Gould’s 100th. It’s too bad, as it is a genuine valedictory, offering the best from a major composer in the final years before his death 1996. Perhaps realizing that his true strength lies in melodic slow movements, Gould follows “Dirge” with a short lovely “Ballad” that suggests one of his long-ago pop arrangements in more opulent finery. Finally, the old professional gives us a stomping “Strum.” It’s not my favorite style of Gould, but undoubtedly he’s learned to give a lay audience reason to applaud enthusiastically at the end of an unfamiliar work. Gould was a virtuoso pianist who should have recorded as a soloist more often, but his imagination wasn’t always in top gear when writing for his own instrument. I’ve seen the scores to almost all his piano music; the most intriging are a late set of perpetual motion studies, Patterns, and a Fifties concerto, Dialogues, that has curious-looking dodecaphonic laments and dances. It’s surprising that Patterns hasn’t been recorded by now; really someone should try the suite out; it looks really nice. Probably Dialogues hasn’t been heard since the premiere in November 1958 with the composer at the keyboard. Is there a tape somewhere of that performance? 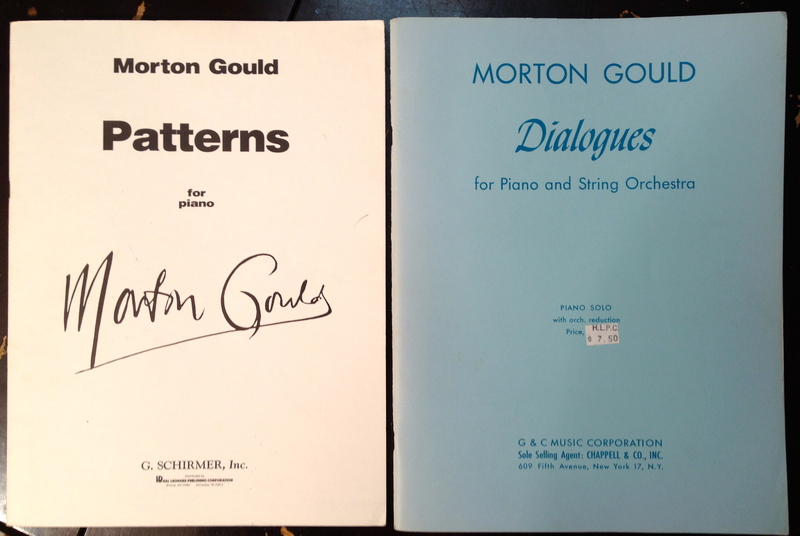 Best wishes to Morton Gould on the occasion of his 100th birthday. My own wish is that I eventually get to hear these two piano pieces!